Purex Oh Baby! Sweepstakes: $500 to 3 Winners, Purex to 250 Winners! 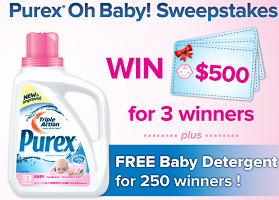 Purex Oh Baby Sweepstakes with 253 Winners!! There will be 3 first place prizes of $500 in the form of a check or gift card and 250 2nd place prizes of a Coupon for a free 50oz Bottle of Purex Baby Detergent!! Ends January 25th. I love Purex. I just bought a bottle today. It is my detergent of choice. I love it too and it seems to agree with my sensitive skin which helps alot too. Thanks for the great giveaway. I use this stuff all the time! great detergent!